The page numbers of The Scientific Outlook based on the 2nd edition of the 1919 Unwin Brothers-published original. Other versions say this book was first published in 1931, with a second edition in 1949. Founding patron of the CIA- and Rockefeller-backed Congress for Cultural Freedom 1950-1956. Anti-nuclear activist (a first-rate "liberal CIA" and Rockefeller-backed activity) in the 1950s and 1960s. 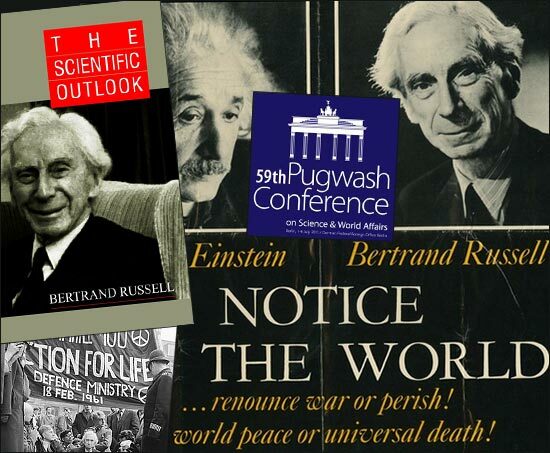 Co-author of the 1955 Russell–Einstein Manifesto, calling for nuclear disarmament and initiated the Pugwash Conferences, which drew in elites as Henry Kissinger, Robert McNamara and the Prince Sadruddin Aga Khan. The latter two belonged to the 1001 Club. It appears though that Russell did not know these individuals very well, whose anti-thesis he was to a large extent during the Vietnam War of the 1960s and 1970s. In 1964 he formed the Who Killed Kennedy Committee in England, based on questions raised by CIA asset Mark Lane, who initially made career as a prominent JFK researcher and later as a lawyer to the suicidal Jonestown Cult. On September 6, 1964 he had his highly skeptical article 16 Questions on the Assassination published. Key founder in November 1966 of the Russell Tribunal (International War Crimes Tribunal), which privately investigated and criticized U.S. foreign policy in Vietnam. 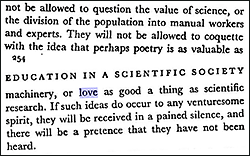 Russell's The Scientific Outlook (1919 or 1931), which preceded all the above activism, can be compared to Aldous Huxley's Brave New World (1932) and George Orwell's 1984 (1949). It's often portrayed online as containing Russell's description of his own ideal dictatorial society. However, in the book he clearly describes it as a work of fiction, which may or may not become reality to some extent in the future. That having been said, elements of the society he describes are very much worth reading. If he can dream these things up, so can elites who actually would love to implement such a system at some point. It's also not entirely impossible that the extreme views presented in them will at some point be used in divide and conquer games, especially when looking at Russell's own apparent CIA ties. The scientific society which has been sketched in the chapters of this Part is, of course, not to be taken altogether as serious prophecy. It is an attempt to depict the world which would result if scientific technique were to rule unchecked. The reader will have observed that features that everyone would consider desirable are almost inextricably mingled with features that are repulsive. The advantages to be derived from an organized world State are great and obvious. There will be, in the first place, security against war and a saving of almost the whole effort and expense now devoted to competitive armaments: there will be, one must suppose, a single, highly efficient fighting machine, employing mainly aeroplanes and chemical methods of warfare, which will be quite obviously irresistible [to be used against uprising? ], and will therefore not be resisted. Education has two purposes: on the one hand to form the mind, on the other hand to train the citizen. The Athenians concentrated on the former, the Spartans on the latter. The Spartans won, but the Athenians were remembered. Education in a scientific society may, I think, be best conceived after the analogy of the education provided by the Jesuits. The Jesuits provided one sort of education for the boys who were to become ordinary men of the world, and another for those who were to become members of the Society of Jesus. In like manner, the scientific rulers will provide one kind of education for ordinary men and women, and another for those who are to become holders of scientific power. Ordinary men and women will be expected to be docile, industrious, punctual, thoughtless, and contented. Of these qualities probably contentment will be considered the most important. In order to produce it, all the researches of psycho-analysis, behaviourism, and biochemistry will be brought into play. Children will be educated from their earliest years in the manner which is found least likely to produce complexes. Almost all will be normal, happy, healthy boys or girls. Their diet will not be left to the caprices of parents, but will be such as the best biochemists recommend. They will spend much time in the open air, and will be given no more book-learning than is absolutely necessary. Upon the temperament so formed, docility will be imposed by the methods of the drill-sergeant, or perhaps by the softer methods employed upon Boy Scouts. All the boys and girls will learn from an early age to be what is called "co-operative," i.e., to do exactly what everybody is doing. Initiative will be discouraged in these children, and insubordination, without being punished, will be scientifically trained out of them. Their education thought will be in great part manual, and when their school years come to an end they will be taught a trade. In deciding what trade they are to adopt, experts will appraise their aptitudes. On those rare occasions, when a boy or girl [seems to be] the intellectual equal of the rulers, a difficult situation will arise, requiring serious consideration. If the youth is content to abandon his previous associates and to throw in his lot whole-heartedly with the rulers, he may, after suitable tests, be promoted, but if he shows any regrettable solidarity with his previous associates, the rulers will reluctantly conclude that there is nothing to be done with him except to send him to the lethal [death] chamber before his ill-disciplined intelligence has had time to spread revolt. This will be a painful duty to the rulers, but I think they will not shrink from performing it. Those children, on the other hand, who are destined to become members of the governing class will have a very different education. They will be selected, some before birth, some during the first three years of life, and a few between the ages of three and six. All the best-known science will be applied to the simultaneous development of intelligence and will-power. Eugenics, chemical and thermal treatment of the embryo, and diet in early years will be used with a view to the production of the highest possible ultimate ability. 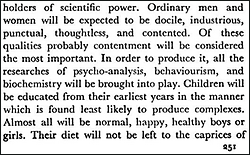 The scientific outlook will be instilled from the moment that a child can talk, and throughout the early impressionable years the child will be carefully guarded from contact with the ignorant and unscientific. From infancy up to twenty-one, scientific knowledge will be poured into him, and at any rate from the age of twelve upwards he will specialize in those sciences for which he shows the most aptitude. At the same time he will be taught physical toughness; he will be encouraged to roll naked in the snow, to fast occasionally for twenty-four, to run many miles on hot days, to be bold in all physical adventures and uncomplaining when he suffers physical pain. From the age of twelve upwards he will be taught to organize children slightly younger than himself, and will suffer severe censure if groups of such children fail to follow his lead. A sense of his high destiny will be constantly set before him, and loyalty towards his order will be so axiomatic that it will never occur to him to question it. 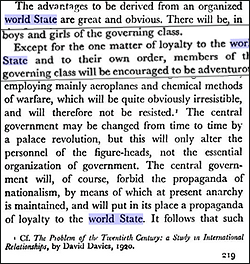 Except for the one matter of loyalty to the world State and to their own order, members of the governing class will be encouraged to be adventurous and full of initiative. It will be recognized that it is their business to improve scientific technique, and to keep the manual workers contented by means of continual new amusements. As those upon whom all progress depends, they must not be unduly tame, nor so drilled as to be incapable of new ideas. In normal cases, children of sufficiently excellent heredity will be admitted to the governing class from the moment of conception. I start with this moment rather than with birth, since it is from this moment and not merely from the moment of birth that the treatment of the two classes will be different. 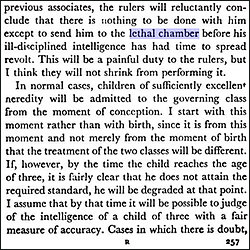 If, however, by the time the child reaches the age of three, it is fairly clear that he does not attain the required standard, he will be degraded at that point. I assume that by that time it will be possible to judge of the intelligence of a child of three with a fair measure of accuracy. Cases in which there is doubt, which should, however, be few, will be subjected to careful observation up to the age of six, at which moment one supposes the official decision will be possible except in a few rare instances. Conversely, children born of manual workers may be promoted at any moment between the age of three and six, but only in quite rare instances at later ages. I think it maybe assumed, however, that there would be a very strong tendency for the governing class to become hereditary, and that after a few generations not many children would be moved from either class into the other. This is especially likely to be the case if embryological methods of improving the breed are applied to the governing class, but not to the others. The latest stage in the education of the most intellectual of the governing class will consist of training for research. Research will be highly organized, and young people will not be allowed to choose what particular piece of research they shall do. They will, of course, be directed to research in those subjects for which they have shown special ability. A great deal of scientific knowledge will be concealed from all but a few. There will be arcane reserved for a priestly class of researchers, who will be carefully selected for their combination of brains with loyalty. One may, I think, expect that research will be much more technical than fundamental. The men at the head of any department of research will be elderly, and content to think that the fundamentals of their subject are sufficiently known. Discoveries which upset the official view of fundamentals, if they are made by young men, will incur disfavour, and if rashly published will lead to degradation. Young men to whom any fundamental innovation occurs will make cautious attempts to persuade their professors to view the new ideas with favour, but if these attempts fail they will conceal their new ideas until they themselves have acquired positions of authority, by which time they will probably have forgotten them. The atmosphere of authority and organization will be extremely favourable to technical research, but somewhat inimical to such subversive innovations as have been seen, for example, in physics during the presen century. There will be, of course, an official metaphysic, which will be regarded as intellectually unimportant but politically sacrosanct. In the long run, the rate of scientific progress will diminish, and discovery will be killed by respect for authority. Friendships between fellow-workers, whether of the same or of different sexes, will tend to become ardent, and will not infrequently overstep [set emotional] limits. ... By means of governmental microphones the censors will listen-in to their conversations, and if these should at any time become tinged with [emotional] sentiment disciplinary measures will be adopted. All the deeper feelings will be frustrated, with the sole exception of devotion to science and the State. I think the subject which will be of most importance politically is mass psychology. ... Its importance has been enormously increased by the growth of modern methods of propaganda. Of these the most influential is what is called 'education'. Religion plays a part, though a diminishing one; the Press, the cinema and the radio play an increasing part.